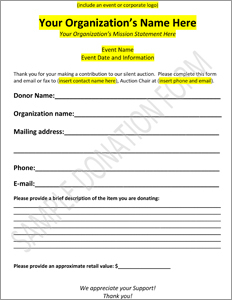 Incorporate an auction donation form into your outreach efforts to increase fundraising and the donation of silent auction items for charity. We have included a sample auction donation form to help you craft your very own. A successful charity auction should include a blending of high-end and low-end fundraising items that allow all of your guests to have an opportunity to bid on an attainable item. Gain the very best items in an efficient manner from commercial vendors from around your community. Click here for a sample auction donation letter for use in communicating with vendors around your community. 1. Let the vendor know up front what’s in it for them and for their business. Sure it feels great for the business owner to help a charity in need, but it sweetens the deal if you show the merchant a marketing related benefit. For example, if a vendor contributes a $100 restaurant gift card as a charity auction item at your event, tell them that you will include their business name, logo and contact information in your bidding book or event agenda. 2. You can never ask too early. Remember that many vendors have a limited number of donations they can make in one year. Even if your charity auction is scheduled for November, it’s ok to begin asking in January or February for auction items. If you wait until the month before your event, it’s possible that other charities and groups have already collected the available donations and silent auction items. 3. Remember to contact any vendor that has donated over the last few years. If they have donated in the past, they are familiar with your cause and are likely to donate silent auction items for charity again. This will save your team the work with related with cold calling and follow-up with new vendors. 4. Always remember to thank your donors and report on the success of your event and their items. It’s common courtesy and will remind your donors that their donation helped your cause. Including a charity donation form along with your thank you will assist in organizing your charity auction items and keeping auction item descriptions consistent. Having served over 10,000 non-profits worldwide, Charity Fundraising would love to assist you in planning your next live or silent auction. Contact Charity Fundraising today!